(0 Customer Reviews) | Write Review 6 issues per year Black Beauty & Hair is the leading hair and beauty magazine for women of colour throughout the UK and Europe. It is an exciting mix of hair, beauty and lifestyle with stunning reader make-overs and in-depth features on skincare and hair maintenance. The cutting edge hairstyles are the creation of award winning stylists from across the UK, Europe and the US and are beautifully photographed and stylishly presented. The magazine addresses the diverse hairstyling and beauty needs of Black women, which you won’t find anywhere else. There are regular articles on haircare, celebrity features, and product reviews. The stunning makeovers and step-by-steps, show just how easy it is to transform your look. Each issue carries a supplement that focuses on a specific area such as bridal, hair colouring or weaves. Articles are thoroughly researched to provide the latest development in ethnic hair and beauty. Black Beauty & Hair enjoys a worldwide reputation for editorial excellence and stylish presentation. It reflects the confidence of young Black women who are at the forefront of hair, fashion and street style. April May issue OUT NOW ! Spring is in the air and what better way to celebrate it than with the April/May issue of Black Beauty & Hair. This issue features Hollywood It girl Lupita Nyong'o and find out her hair and beauty secrets. Take a look at our gorgeous hair and beauty ideas – there's plenty there to inspire you. Getting married? Check out the bridal supplement. It's crammed full of bridal styles, beauty tips and much more to get you looking like a princess on your special day. 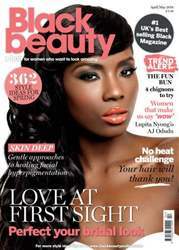 Black Beauty & Hair is the leading hair and beauty magazine for women of colour throughout the UK and Europe. It is an exciting mix of hair, beauty and lifestyle with stunning reader make-overs and in-depth features on skincare and hair maintenance. The cutting edge hairstyles are the creation of award winning stylists from across the UK, Europe and the US and are beautifully photographed and stylishly presented. The magazine addresses the diverse hairstyling and beauty needs of Black women, which you won’t find anywhere else. There are regular articles on haircare, celebrity features, and product reviews. The stunning makeovers and step-by-steps, show just how easy it is to transform your look. Each issue carries a supplement that focuses on a specific area such as bridal, hair colouring or weaves. Articles are thoroughly researched to provide the latest development in ethnic hair and beauty. Black Beauty & Hair enjoys a worldwide reputation for editorial excellence and stylish presentation. It reflects the confidence of young Black women who are at the forefront of hair, fashion and street style. 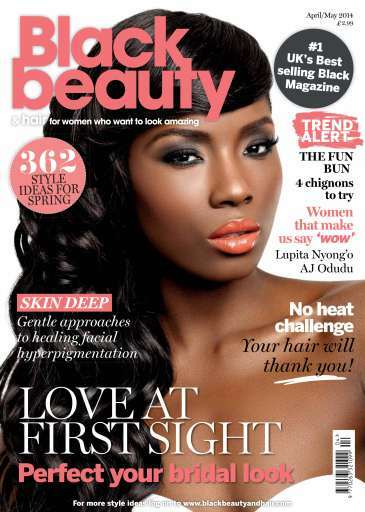 You'll receive 6 issues during a 1 year Black Beauty & Hair – the UK's No. 1 black magazine magazine subscription. You'll receive 6 issues during a 1 year Black Beauty & Hair – the UK's No. 1 black magazine magazine print subscription.